When an old fox meets a young beech marten something happens, it's inevitable. What happens if the old fox is David Byrne and he meets the woman that has catalyzed all the looks of indie-rock addicted, aka St Vincent, whose real name is Anne Clark? You'll find out from September 10th when their album -"Love this Giant" will be released. The couple has posted on the web site that promotes the record -www.lovethisgiant.com - many writings with explanations, reasons and cop-out for fellowship. Therefore, I will not linger on the reasons behind this album as they explain them very well in the above-mentioned website. Instead, I would like to tell you about my impressions after having listened to the tracks of "Love this Giant". It's a work in a real New York style more than in a mestizo style. It's a fusion of the experiences of the two artists with afro-like rhythms, random melodies, loads of winds - of the strangest kind oboe, trombone, horns.and other electronic selections. The first song - "Who" - can be downloaded free from the site of the album if you submit your e-mail address. In this track, David Byrne and Anne Clark sing in duet. He is hieratic as usual and she has a fascinating odalisque-like voice, the percussions beat flatteringly in the background. You'll love it at once. It'll remind you of Rei Momo, one of the most amusing works by David Byrne. The final result is fetching. The other tracks present those counterpoints and musical plays with the winds I already referred to. It's never gothic or redundant as it might have happened if David Byrne, which founded with Brian Eno The Talking Heads, had lost control for a second. 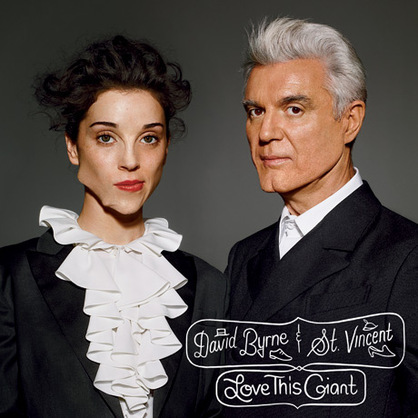 Looking at the stern cover of the record - with St. Vincent dressed like a Victorian age nun and David dressed like a pedantic Mormon preacher - one would never expect to find a record so pleasant and up to date. To conclude, the musical fall starts in the right way, the other records that are disclosing at the horizon of the Indie music promise magic. It'll be a wonderful musical season that'll make us forget the uncertainty of this musical spring and summer.